We are a community of freestyle dancers located in Tucson, Arizona. We meet regularly for freestyle dancing, and for the rich emotional and social connections brought about by moving together in a space full of acceptance and free of judgement. Come dance, in whatever way your body feels like moving. There is no right or wrong way to dance with us, there are no predetermined moves. As your body moves, so may your thoughts and emotions. If you feel like being still, be still. If you feel like being energetic, then be energetic. Your expressions of joy, grief, and other emotions will be safe and respected. Feel free to move through these spaces and any others you may find yourself in or wanting to explore. Come dance to meet others, and to establish and strengthen friendships. Ours is a large, diverse, and welcoming community. While we meet regularly through dance, the connections developed on the dance floor extend out into innumerable facets of our lives. A safe place to be and express yourself, to celebrate, to have fun, to help yourself work through difficult times and emotional spaces, to feel movement. We are not affiliated with any religious or political organizations. Whatever your beliefs may be, you will be welcomed through your own welcoming of others. A wide assortment of music and styles, such as world music, electronic, classic rock, alternative, techno, jazz ... just about anything. Slower music to warm up to at the beginning of a playlist, gradually becoming fast and energetic, and winding down to gentle soothing tunes at the end. 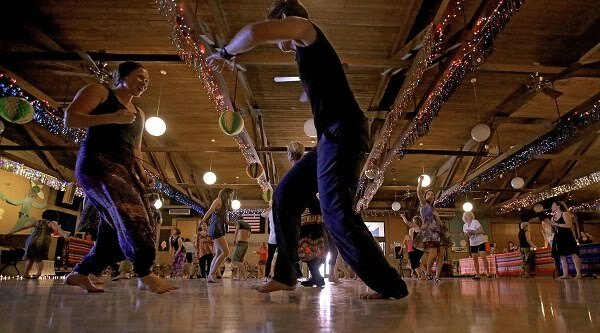 Check out the article in Tucson's Arizona Daily Star about our Sunday morning dances!